Volcanism is the phenomenon of eruption of molten rock ( magma) onto the surface of the Earth or a solid-surface planet or moon, where lava, pyroclastics and volcanic gases erupt through a break in the surface called a vent. 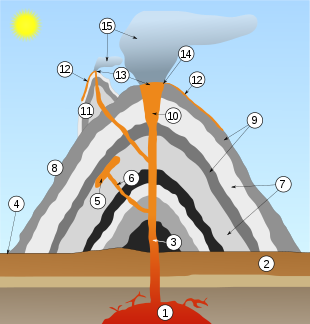 It includes all phenomena resulting from and causing magma within the crust or mantle of the body, to rise through the crust and form volcanic rocks on the surface. Movement of molten rock in the mantle, caused by thermal convection currents, coupled with gravitational effects of changes on the earth's surface ( erosion, deposition, even asteroid impact and patterns of post-glacial rebound) drive plate tectonic motion and ultimately volcanism.